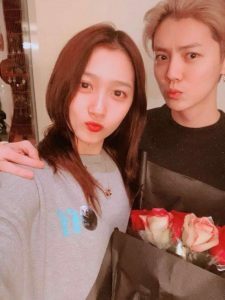 When Lu Han (鹿晗) revealed last October that he is dating his Sweet Combat <甜蜜暴击> costar Guan Xiaotong (关晓彤), a lot of his fans left. One of the biggest open secrets of becoming a successful idol is to stay single, and if you are in a relationship, it has to stay hidden. For Lu Han, that was definitely something he considered. It is a popular opinion to assume that idols only have the looks, but not the talent. 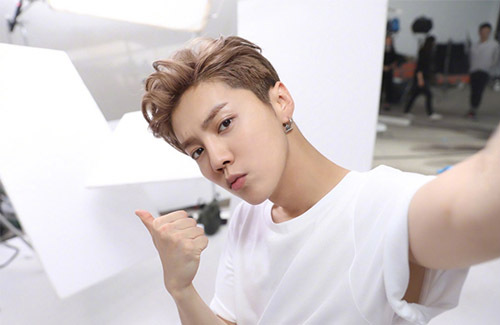 “Flow celebrities” (流量明星) like Lu Han, who has a huge online fanbase, has footprints all over the Internet, and any move he makes would make it to trending charts on social media. Lu Han has to be smart with his decisions and careful with his words. “I’m used to it,” he said. Lu han does have talent it might not be acting but he got to have some kind of talent to have a strong fan base. It’s not wrong for people to date I don’t get why fans become so delusional in thinking their idols will be single forever. Other than his fans getting mad it might be the people who can’t stand their acting as both are pretty disappointing. I agree with you to some extent but it depends on the situation as some fans can go crazy if their idols announce they are dating. One of Jackie Chan’s fans committed suicide when she found out he was married. However, I do admit that it is a lot better to admit it, especially if you are caught red handed. People will know it sooner or later so why hide for and then having to apologize and then explain it all. It actually is not rare for celebs to announce they are in a relationship these days as more and more are opening up and many fans are more understanding and realistic about it. Of course it depends on the person too as some still lie through their teeth even when it is sooooo obvious! @hetieshou Uhm, the situation you said can’t be the justification for not admitting one’s relationship or not. How would you know whether your fans are crazy or not? And if you have a large followers, by chance, a few of them would be crazy. Sooooo you can’t live by the fans, that’s just unrealistic :/ I agree there are more and more cases of people opening up about being in a relationship, however, considering Lu Han is from the kpop culture where relationship is a big no no, and it’s still rare of them to opening up so soon in the relationship, he’s therefore quite brave. Yeh. Can’t be justified by irresponsibly lying to millions of fans and taking their money just to protect the handful of fans ‘who may potentially’ go crazy. Who is going to protect the millions of fans who are given lied to and are out of pocket? The public were still getting bombarded by advertisements to grab the fans hearts. It does not add up to protect the few that ‘may not exist’ to trick the millions that ‘do exist’. The only thing that adds up is the money going into Andy Lau’s pocket. There was a huge incentive for him to lie. If Andy was going the ‘Tony Leung’ solid ability route then he has every right to hide his relationship but he is going the ‘idol’ route…. I agree but that is just what we think as we are not them. Andy lied and karma bit at him but now that it is all out in the open, people still support him. I admit that it was very wrong of Andy to lie so much and for so long. He should have told the truth earlier. Wu Chun did as well and is now on the over exposure mode. Same with Jimmy Lin. I am shocked their teeth did not all fall out for lying so much. Actually, you give Tony too much credit in that area. I heard he did not handle the situation with Kitty Lai very well. It caused Kitty a lot of heartache. Well Andy obviously knows how crazy his fans are as we also have seen so there is no denying it. Yes it is still wrong to lie and he suffered and karma bit directly back at him. It is great that Lu Han is sharing as he is in his late 20s so he hopes to have his own family and all. Not sure how often you follow idols news but I have seen quite many of them sharing pretty early so it is not just him. But I do give him credit for doing so. Yes, his maturity level, sense of responsibility to his girlfriend and integrity really needs to be praised and respected. The fact that being honest about his relationship means more to him than his fame, is truly admirable. So many artistes, even ones who are twice his age, heres looking at you Andy Lau, Would much prefer to date underground than to lose their fan base. I admire his courage to announce his relationship but many others do these days too so it is not just him. Why do people always pick on Andy in regards to that issue? I admit that Andy should have admitted it earlier, but he suffered backlash and is more open about it now. Are celebs obligated to share their love life with everyone? It depends on the situation too. If they promised beforehand to share with everyone like some(Wu Chun and Jimmy Lin) and then still lied then that is not right. They lied and tried to hide everything but now over expose their children on those reality shows. Why suddenly the 180 degrees turn? However, if they never said they would share or just kept quiet then that is a bit more forgivable. Stars are not obligated to share their relationships. No,you are right. However, if they are being interviewed continously over the years and they they repeat that they are single and also say ‘let fate decide’ etr and all this rubbish then it is lying to fans and giving them false hope. Andy Lau has probably been giving these statements thousands of times over the years but also profiting from the same fans. Many of them would have moved on to other idols if they knew he was married. Although it’s not a crime, its morally questionable…. I agree and used to really hate it when celebs lie through their teeth about this issue. Why don’t they just admit it so they do not have to hide and get sneaky? Actually many suspected that he was with his current wife for years already so it was sort of an open secret. Regarding his fans, we have seen how crazy they are so to be fair, can we blame him 100%? He said one of the main reasons he did not expose his wife was he was afraid the mafia will be after her. Maybe he is too protective of her. I can sort of understand that as my late parents treated me the same way. @hetieshou Andy is generally the first person who springs to mind because he had kept the relationship a secret for so LONG…i may be wrong, but over the years he has probably lied and denied it in order to keep it a secret. Everyone, probably felt sorry for his wife/oartner. You are right many Chinese celebs now are much more open about their relationships. But i was thinking more of K celebs and idols. Generally most of them still keep their relationships a secret. I can’t respond to your comments about reality shows and over exposure with their kids. I have never watched any of these programs. Finally, celebs are not obligated to share their private lives, but it is of course normal and expected that people are interested in this aspect of their lives. I think it becomes a problem when celebs outright lie, hide, deny when there is proof stating otherwise. Remember Ah Sa and Ronald Cheng? Why lie? If there’s evidence, dont lie and deny, fans feel deceived. I admit that Andy was wrong to hide it for so long but he has his reasons which we may or may not agree with. Actually, many suspected that he was with his current wife for many years already so it was sort of an open secret. It is great that they are more open now as it is wrong to continuously lie through your teeth even when it is so obvious. I do agree that it is so wrong and deceiving of celebs to straight out lie even when caught red handed. That is why I do not trust many things that celebs say anymore since they lie through their teeth just like politicians. By the way, people always say fans should not dream of marrying their idols, but that does happen although it is very rare. Kevin and Grace are a good example. However, it all comes down to fate. It’s only an open secret to people close to the media and those with logical thinking. However, we cant expect to fan to have that ability and certainly can’t blame them for following an idol when its the mass promotions of the idols that get the fans obsessed. Fans come from all sorts of educational backgrounds worldwide and if there is a glimmer of hope, they will cling onto it…. It depends on the fan as many of the mature ones could careless as long as he was happy. But sadly, not all fans are the same and some are crazy as we have seen. I do not like Ruby Lin so could careless about her love life or whatever. Yes it is wrong to lie and karma bit at Andy but fans now know and support him regardless. But he suffered for it and was labeled the king of lying. I was not trying to defend Andy because he lied and got punished which is why he is more open now since there is nothing more than hide.